Hello, there! 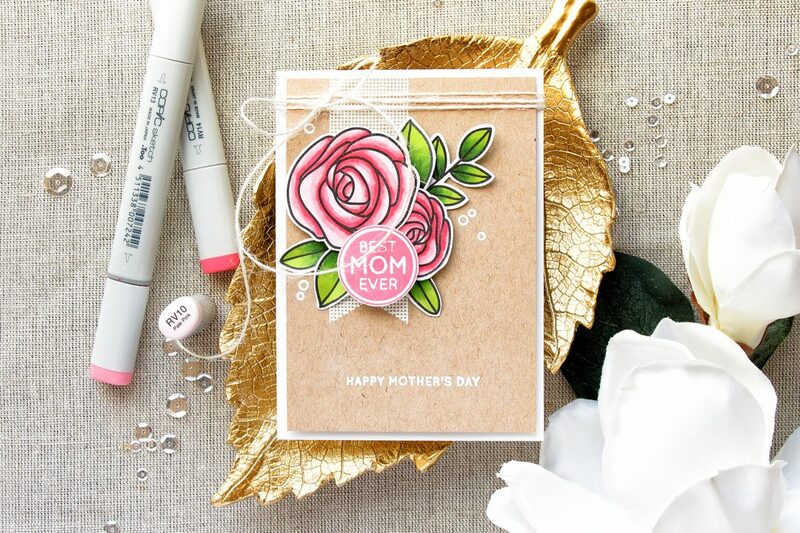 I’m very excited to share this elegant Best Mom Ever card I made using new products from Simon Says Stamp’s Mothers, Fathers, and Flowers release that went live today! Even though I have already made a Mother’s Day card for my Mom I still had one to make for my Mother-in-Law. 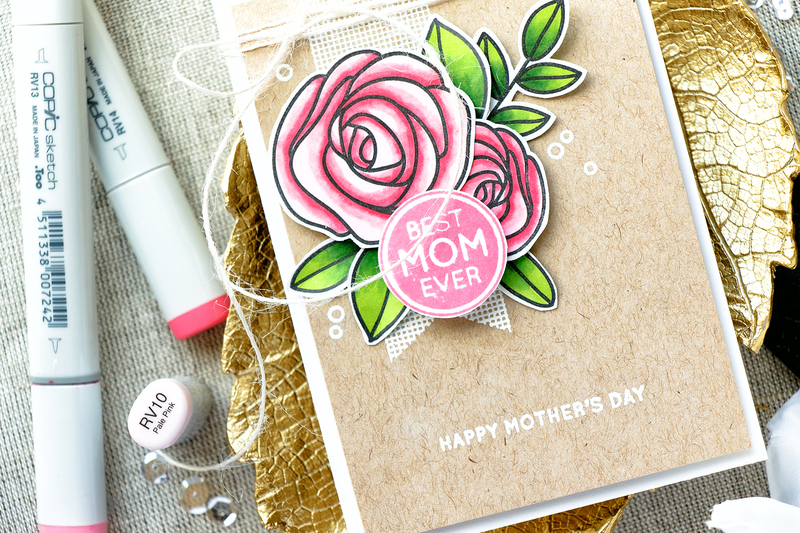 She will be visiting us in the second half of April, so I was very happy to play with Simon’s Best Mom Ever stamp set (which actually turns out to be an older set, so check your stash – you might already have it! 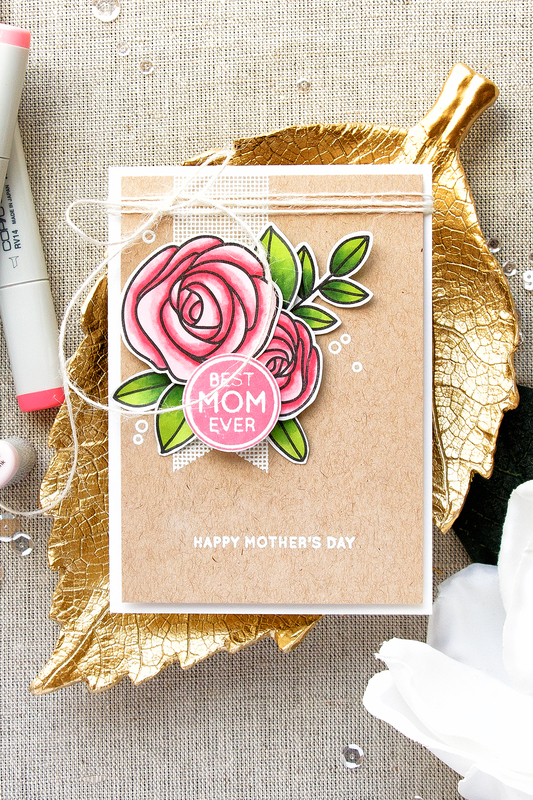 This was a new set for me, so I didn’t even realize at first it’s an oldie but goodie) and create this dainty little card. This is once again a 4 Bar size card, so smaller than a typical A2. I started working on this project by stamping roses and leaves using Simon’s Intense Black ink and coloring with my go-to Copic marker colors. I used RV14, RV13 and RV10 for the roses and YG67, YG17 and YG03 for the leaves. I cut my images out using scissors and arranged into a cluster. 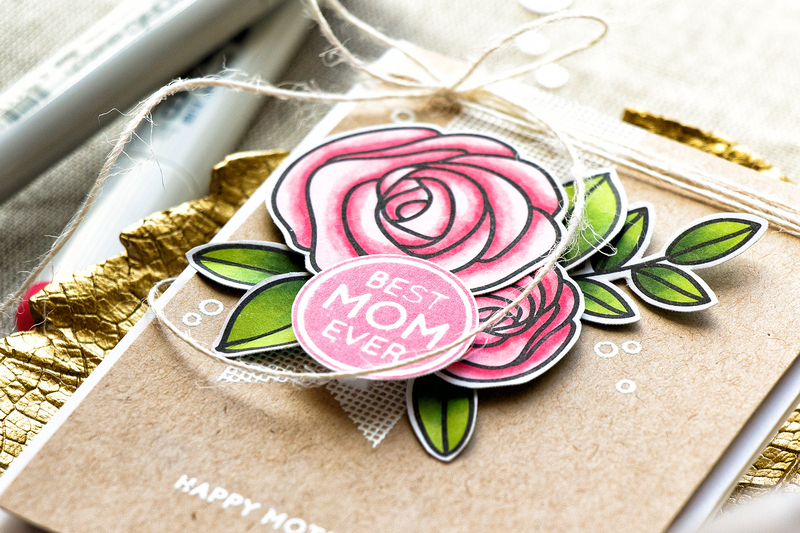 I only did two roses as I knew I wanted to replace the 3rd one with a circle sentiment – Best Mom Ever. I used Hollyhock ink and stamped it onto white, cut out using scissors. 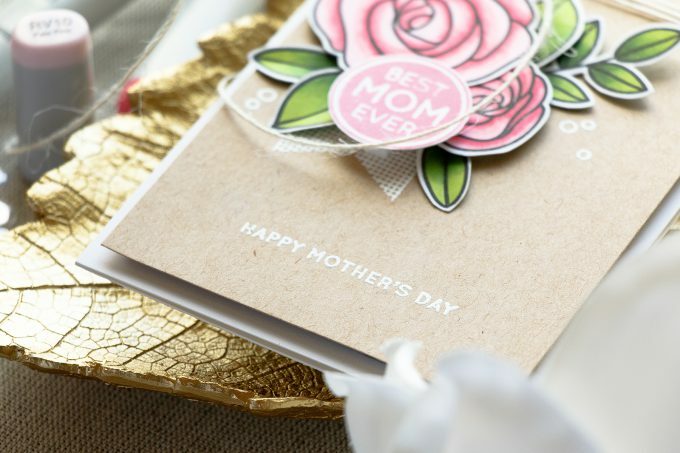 I love the look of white on kraft, so I pulled out of my kraft paper, heat embossed a delicate perforated-looking ribbon in white and also added a white “Happy Mother’s Day” heat embossed sentiment. After foam mounting my roses and adhering leaves using glue I added several additional white heat embossed circles out my floral cluster. I used white fun foam to add dimension and foam mount my kraft panel onto a 4 Bar card base. I also added a bit of natural twine from May Arts to complete this look. Yana. I really do love your card. You do such beautiful word.. The colors are beautiful and I like your interpretation of the products. Your work is inspirational. Absolutely beautiful Yana, there is something about kraft cs that I just love. It seems to make such an impact! Beautiful! Love the pink flowers with the white and the kraft. I really like the look of those roses. Just so modern! Such a sweet and darling card! Love kraft base and these adorable roses. Great touch with the embossed ribbon! Love what you’ve done with the roses. Your layering shows them off so well. Thanks for sharing this card. Beautiful card! I love all of your details!! Thanks for sharing. Very pretty card. I love the coloring and the awesome images. Gorgeous. 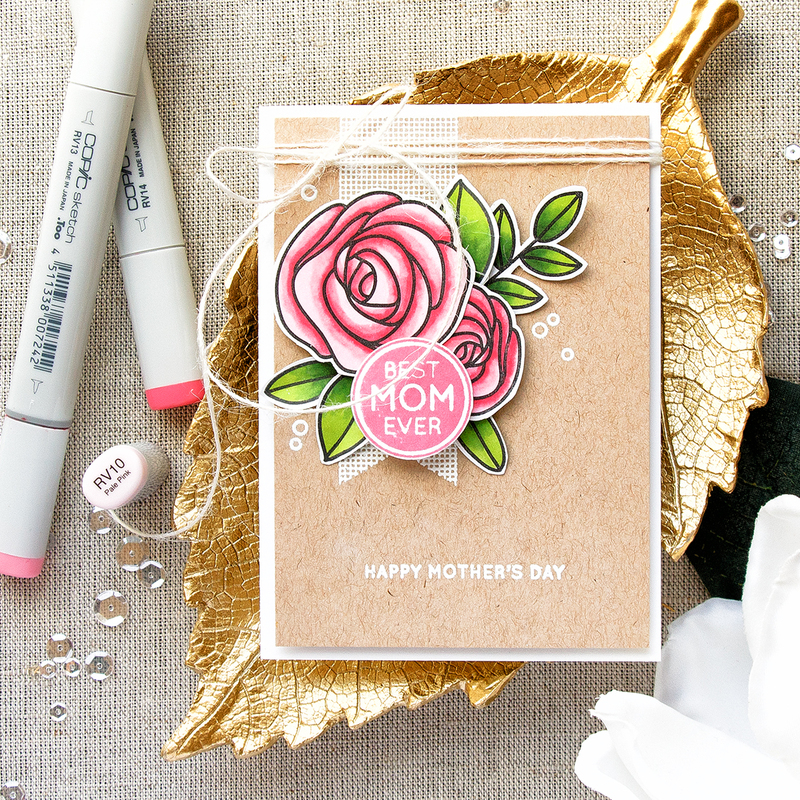 I love the pinks and greens on the kraft background. It has such a natural looking beauty to it. TFS! Yana, Beautiful card and I love that you used an older set! I wish Simon Says Stamp would have a weekly feature on those many sets that we all have accumulated over the years….like a Throw-Back-Thursday! I will have to suggest that to them, but in the meantime, please continue on you own to create more from older sets if you have time! So glad that SSS brought back this stamp set…it really is a classic beauty. Thanks for the inspiration on new ways to use it!! Soft and beautiful colors. Love it and especially love the awesome images. Thank you. love the Kraft card stock your cards are on, really makes the Simon Says ink pop.. thankyou once again for sharing your awesome talent.. I love your card! This stamp set is one of my most used.